Move in day. I cannot believe it has been over a month in our new place now, I really need to hurry up and get everything unpacked and looking pretty! 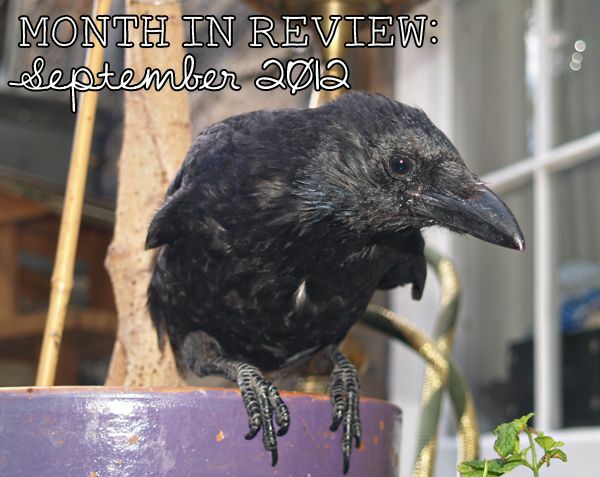 Meeting my first ever tame crow, this wee one was injured at the beginning of summer and taken in by one of my friends. It's all better now, and free to leave, but whenever anyone goes in their backgarden it comes over to say hi. It's beautiful, but unfortunately has a habit of doing its business while sitting on peoples shoulders. This month I spent way to much time in front of the TV, I've recently got back into cross-stitch and embroidery so I've been curled up watching Pushing Daisies and lots of Disney films while making things. I've also spent a lot of time trying to find free art online, I really want to decorate our house but currently can't afford to buy stuff from my favourite artists so I've been taking advantage of lots of free printables for decorating purposes - luckily I found the Free Art Project through Smile and Wave, which has loads of beautiful stuff. I also got rid of 3 bin bags of clothes that I no longer wear, impressive considering how much of a hoarder I am! Cold weather, hot drinks, the possibility of a new laptop on the horizon, Halloween and all the decorating it involves, living with a group of people I love. No new to me blogs this month as I've barely been online but I promise I'll have lots to share with you next month! A tame crow? So cute! Glad you're settling into your new place and life is going well!